This game will be a rematch of arguably the worst game of UP's season to this point, a 70-42 drubbing at SCU that started the Pilots current eight game slide after winning the first two games of the WCC season. In that game the plan was to always have a defender in Brownridge's grill to keep him from scoring, so of course Healy scored 19, and AJ Fagin, in his first game back after injury, scored 17, while Brownridge was limited to just eight points. SCU splashed 14 3-pointers and had only 6 turnovers while UP committed 17 turnovers, including 7 by Alec to go along with his season low 8 points....so to say the Pilots were out of sync and Coach Sendek's crew was well prepared, would be an understatement. What's it going to take to turn that result around in Thursday's game? I'm not sure anyone knows the answer to that. Some would say they Pilots have got to get off to a quicker start after scoring only 22 points in the first half last time, but the reality is they were up something like 18-9 in the early going, then scored only 24 the rest of the game. One has to wonder if the coaches plan to play the usual transition defense and get back quickly after a missed shot even though SCU generally plays a slow-paced boring style of game. If SCU continues bombing away from outside, the Pilots will need to get the offensive boards just to keep up. I do expect UP will play the tall guys (hard to call Joseph "big"), and they should control the glass, but will it be enough? Thursday is Groundhog Day....will Punxsutawney Phil see his shadow, or will Phil Hartwich cast a shadow over the Broncos inside game for the Pilots? DoubleDipper wrote: In that game the plan was to always have a defender in Brownridge's grill to keep him from scoring, so of course Healy scored 19, and AJ Fagin, in his first game back after injury, scored 17, while Brownridge was limited to just eight points. Since the weekend they played the Pilots, Brownridge averaged 24.6 ppg over 5 games, until he only got 13 in a loss to SMC last Saturday. SCU won all those games except the GU game. SCU is one game behind BYU in the standings, at 6-4. They've lost once to each of the big 3, once at LMU and beat BYU at home. Once again the forecast calls for a wintery mix in Portland. I guess winter isn't over for us! We’re not going to have near the impressive student turnout for this game as we did Saturday night against USD…..mainly because it’s Thursday! I had a PM asking me where the students went (most returned) at the 10 minute to go mark during Saturday’s game…..we were given really nice purple and gray Pilots winter knit caps/beanies. (I haven’t seen any on eBay yet). In our environmental class this morning we were talking about the crazy Portland weather, and it was mentioned that more sleet and snow will arrive just in time for Thursday’s game and then turn to freezing rain and ice on Friday. Apparently the forecast is for no more than 2 inches of snow here, but that’s what was forecast 3 weeks ago…. I had to google Punxsutawney Phil (I guess a college education is not what it once was ). If Phil were in Portland he apparently wouldn’t see his shadow and we'd have an early spring! Unfortunately, Phil is in a burrow in the borough of Punxsutawney, PA.
StudentPilot wrote: I had to google Punxsutawney Phil (I guess a college education is not what it once was ). If Phil were in Portland he apparently wouldn’t see his shadow and we'd have an early spring! Unfortunately, Phil is in a burrow in the borough of Punxsutawney, PA. Sometime when you need a study break, watch Bill Murray's movie Groundhog Day. Not just for the team, in the stands, too. That just about sums up what Coach Knutson said last night while filling-in on the Terry Porter Show....the players must be listening. BTW, Kramer did an excellent job answering questions, and he was glad to be there as it kept him from having to watch "The Bachelor" on the TV with his wife. 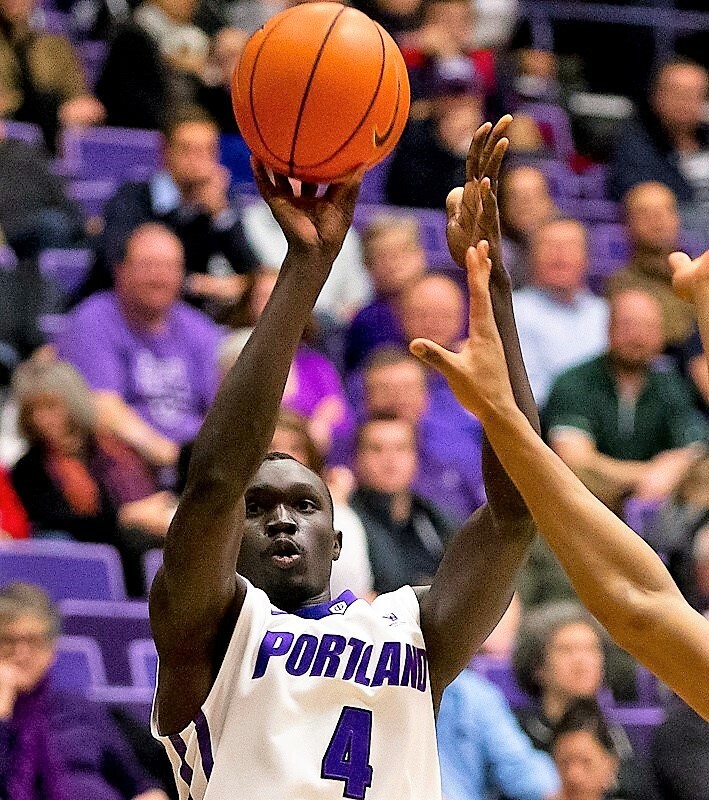 - The Pepperdine game was the fourth in eight days for the Pilots and the San Diego game was the fifth in 10 games. That's a lot for a team without a deep rotation. Four full days between games here not only provides for some rest, but maybe even more importantly this will also be the longest stretch of practice since the post-Wintering era ( ) arrived. - There were several posts in the San Diego thread about not getting Smoyer in. Couldn't agree with them more...at this point, I don't think there's any reason why 8/9 guys shouldn't see the floor in every game starting with tomorrow against Santa Clara. I... watch the Bachelor with my fiancé... been hooked since Chris Siegfried was on it. Love to hear that mindset moving forward. Thanks, StudentPilot. Also, I'm in your avatar picture, I think. Also, was it environmental class with Kolmes, or Butkus, or Eckman, or Coach Bob (I'm a former major if you couldn't tell)? I think this focus on getting the system will be good for the team moving forward. Takes the pressure off of the record. A classmate sent me that picture, but as you can see, it has already changed. It's a long story, but none of the above on professors....since Fr. Ron passed away just before finals in December, things have switched around a little. If by Coach Bob you mean Prof. Butler, he's now retired to Bend. Back to basketball: Here is the picture on the UP website previewing the SCU game....I hope it means Chier gets plenty of playing time. Best hope is Santa Clara taking this one for granted. SouthCarolinaPilot wrote: Here is the picture on the UP website previewing the SCU game....I hope it means Chier gets plenty of playing time. No, they were just trying to use a picture with as many PN members as possible! Falling asleep here, I'm not gonna make it until the end of this one! Doesn't look good, down 11 with under four to go. SCU hasn't had a bucket in 9+ minutes and the Pilots just haven't been able to capitalize. First half was the best I've seen Chier play, on both sides of the ball. I thought we'd see a lot more of him in the second, but I don't think he got in until with eight minutes to go. Dean Murdoch wrote: Falling asleep here, I'm not gonna make it until the end of this one! Doesn't look good, down 11 with under four to go. SCU hasn't had a bucket in 9+ minutes and the Pilots just haven't been able to capitalize. That was painful. I don't think they'll beat Pacific which means closing on a 15 game losing streak. Dean Murdoch wrote: First half was the best I've seen Chier play, on both sides of the ball. I thought we'd see a lot more of him in the second, but I don't think he got in until with eight minutes to go. I'm sure the group around me got very tired of me yelling for more Chier, but the coach obviously had a different idea. I don't think anyone can complain about he blue collar all-out effort, but with no playmaking and no shooting, it's really a wonder the Pilots scored 45 points tonight....only 27 were from the floor, the rest were free-throws. With no dribble-drive and dish help, Jazz again tried to do all he could, but at under 5-10 with two defenders most of the night, he was fortunate to score in double figures. I'll let others comment on whether the team still looked fatigued, or whether SCU is just so much more athletic, especially on defense, they made the Pilots look slow in comparison. UP was a 12 win team last year, including 6 WCC wins.....since then they've lost Alec, Jason and Bryce while picking up 4 freshmen, one of whom doesn't play, so I guess to expect more, especially in WCC play, is asking a little too much with the current squad. I hate saying this, but they're just not fun to watch. I used to come to games, elbows on knees for the entire game. Not anymore. Sit back. Get comfortable, lower expectations. Perhaps unfortunate, but I think they're capable of better with the personnel they have. That was the gist of Cantu's post-game comments. Trust the process and we will be better next year. I love the high recruiting class, but if that's true, why weren't guys like Maker getting more time in the second half? The first half we had 29 points which doesn't look so bad until you see that 15 of them were from free throws. 14 non free throw points in the first half. Santa Clara must have read the same half time box score I did because they didn't foul so much in the second half. Haven't read the final box score. Jason Todd also played 20 minutes a game last year. Would likely have been a big contributor this year. Just because he chose to transfer instead of graduating out doesn't mean we didn't lose him. Also....having posted first and then going back and reading comments I see that you have read the final box score and by my calculations 27 from the floor means 3 from free throws in the 2nd if you subtract the 15 in the first. 14 and 13 from the floor in first and second respectively. Consistently low. What do those numbers look like for the past few games. I haven't looked at recent box scores, but the number of FTs in the first half got me curious. DoubleDipper wrote: UP was a 12 win team last year, including 6 WCC wins.....since then they've lost Alec, Jason and Bryce while picking up 4 freshmen, one of whom doesn't play, so I guess to expect more, especially in WCC play, is asking a little too much with the current squad. Sorry, not understanding your point about Jason....he is included in the three players I mentioned as "lost." So you did. Reading fail.